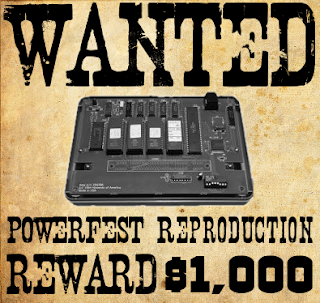 Last year we purchased PowerFest 94 and said we planned to dump the ROMs and make a reproduction cartridge. Below are the ROM files from PowerFest 94, but we have run into a bit of a snag with the reproduction cartridge and are offering $1,000 for the gaming community's help. These are the four ROM files for PowerFest 94 - three game ROMS and one scoring ROM. This version of PowerFest 94 scores 10,000 points per home run. The SNES emulation community will need to do their magic to get these ROMs working correctly on emulators. To help speed up the process we are offering $200 to the first person to release an emulator that successfully plays PowerFest 94. Please contact us to claim the bounty and be sure to include links to the emulator so we can verify the claim. For the last seven months I have been trying unsuccessfully to get a reproduction cartridge made so other gamers can enjoy PowerFest 94 on their Super Nintendo systems. I spent four months in contact with one reproduction company with experience making SNES games. They even ordered a custom circuit board to meet their design specs, but were unable to get the PCB working. I've contacted five other reproduction shops and all of them have said they cannot make it work either. Usually the problem relates to Super Mario Kart, which requires a DSP chip to play. They tell me that this chip makes reproduction much harder. There is one reproduction shop that has successfully reproduced games like Nintendo World Championships and Nintendo Campus Challenge 92, but they are too busy with other projects to make the reproduction at this time. We even contacted circuit board design companies to see if they could help us on a contract basis. None of them would do it because the circuit board design is officially property of Nintendo. Even though we would be designing a new circuit board, none of them wanted to reverse engineer the reproduction. We are still very interested in making a PowerFest 94 Reproduction so other collectors and gamers can play this fun competition cartridge. We are confident there are some gamers, electronic nuts, or other do-it-yourself tinkerers that can get a reproduction working. So we are offering $1,000 to the first person/company that successfully makes a PowerFest 94 reproduction. To sweeten the pot a little bit more, JJGames.com guarantees they will purchase 100 units of the reproduction cartridge at $50 a unit. The winner is not required to sell units to JJGames, but they have that option. Good luck with the emulation and reproduction. I'm hoping we pay these bounties very quickly. Awesome JJ, I love the Bounty Idea... maybe a Reproduction will actually become a Reality!! Thanks to you! Congrats byuu. I've contacted you for the payment stuff. Just got done playing it, 682,800. I got alot of work to do, lol. I can't wait for an actual repro to be released!!! Yeah, I don't think byuu should count. The bounty implies the need for actual PLAYABLITY and byuu's stuff is more... a tech demo. Have you contacted retrousb or super fighter team. They might be able. @unknown - That is a respectable score. I'm sure with a bit of practice you will be over 1 million for sure. @anonymous - byuu's implementation might not be ideal, but I didn't really give qualifications for the bounty and technically the game is emulated with his setup. I'm hopeful that he will fully implement the emulation in the near future and others will as well. Byuu's implementation is ideal, because it does exactly what the hardware does. And every PC today can run Bsnes/Higan with more than 200fps. Zsnes is an old and inaccurate garbage today. Snes9x is a good emulator, but far from the accuracy of Bsnes/Higan. Bsnes/Higan is the future of Snes emulation, and you should use it as parameter. Get on nintendoage and post this link and see what you get. They will help you probably get a repro cart. While on there, PM gwyndion. He's knows pretty much the entire repro community and will point you in the right direction. You should take a hammer an smash everything that is connected to that game it is junk. I will give an reward to the first person to smash it. Jealous much "Anonymous"? The game isn't "junk" not by a long shot. Repro uses the same board as the SNCC92, but with double the ROM and a different CPLD program. All the timer and DIP switch hardware is the same so it has the same time limits. I found more gold painted SNES carts used for the SNCC92 so those will be first. from bunnyboy on the NA thread...no ETA, but that's some awesome news!!! @g_block - Thanks for that update. I hadn't seen bunnyboy's post on NintendoAge about the reproduction. I'm hopeful that he will soon sell these remaining cartridges. I will pay him as soon as I have one to verify the four criteria.